The Treasury of South Georgia & South Sandwich Islands have launched a crown coin which features some the most amazing wildlife found in and around the South Atlantic Ocean. Following the tradition of depicting indigenous local wildlife, this latest crown issued by South Georgia & South Sandwich Islands which features the amazing Humpback Whale. Although found in oceans and seas around the world, the humpback whale, which belongs to the species of baleen whale is found in abundance in the South Atlantic and is one of the larger of its species. Humpbacks can range from 39-52 feet in length and weigh around 36,000 Kilograms or just over 79,000 lbs. Humpbacks are the acrobats of the ocean and are known for breaching and slapping the water although the reason behind these maneuvers is unknown. They are the nosiest and most imaginative whales when it comes to songs with long, varied, complex, eerie and beautiful sounds using the largest range of frequencies used by whales. Humpbacks travel in large groups and when hunting they cooperate by blowing a wall of bubbles as they swim to the surface in a spiral path forcing their prey of krill, plankton and small fish to the surface of the water, known as bubble-net feeding, which ensures the whole pod eat a large meal. The coin is produced by the Pobjoy Mint UK, on behalf of the Treasury of South Georgia & South Sandwich Islands. The design seen on the reverse features an image of a beautiful Humpback Whale breaching the Antarctic waters with an iceberg in the background. The obverse of the coin features an effigy of Her Majesty Queen Elizabeth II by Ian Rank-Broadley FRBS. The crown coin is available in Cupro Nickel and Proof Sterling Silver, the coins are struck to the highest quality with the precious metal versions being produced to proof quality. The design on each coin is in relief with a smooth (BU) or mirror-finish (proof) background. 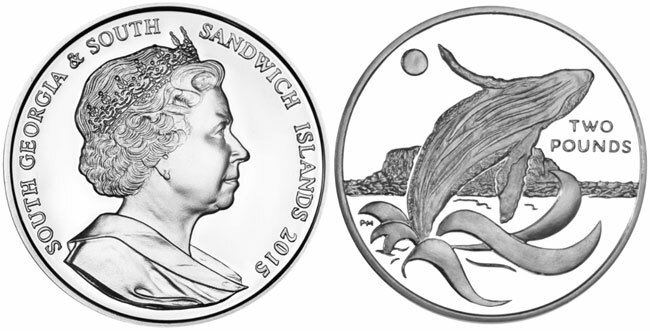 For more information offered by the treasury of South Georgia & the South Sandwich Islands, please visit the website of the Pobjoy Mint at: http://www.pobjoy.com/products/view/south-georgia-south-sandwich-island-2015-the-humpback-whale-proof-sterling Information offered in English, international orders dispatched.